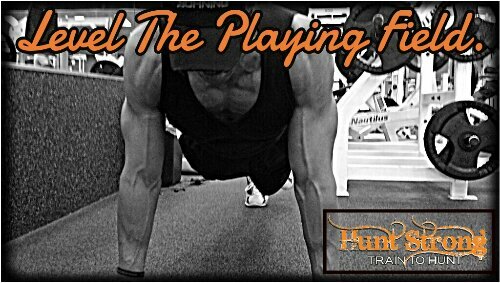 Training Raw - Official Website of Hunt Strong, Find Your FIT! There is no question that hunting, as a sport, will not only challenge the mental aspect of your body, but the physicality aspect as well. Whether you are hunting turkeys, elk or big horn sheep, your body will be tested at some point or another along the way. No matter how hard you train, you will suffer, you will sweat, you will battle, and you will bleed. But how you can minimize the degree of stress to the body depends on how you train. The heavier the weight being lifted, the more technique along with proper form/range of motion is required. I can walk into any gym at any time and see people covered in training accessories, and of course, demonstrating horrible form. There is one thing you will never see me or my clients wear during a training session, that is, weight belts, gloves, wraps, high top shoes, etc., no matter how tough the workout may be. The human body is highly adaptable to any condition you put it in. After all, exercise is nothing more than applying stress to the body. The result, your body tries to adapt and your overall fitness well being (strength & endurance) increases. When you use for example gloves, your hands rely on them every time you grip a bar or dumbbell. Of course, once you ditch the gloves, your hands will hurt after a few days or week of training but then you will build calisus and be right back where you were in no time. Let your body do the work. As I have always said and preach, keep it natural in all aspects of fitness and life. Don’t rely on weight belts, gloves, or any accessories while training, because chances are, you won’t have those available when the time comes. Listen to your body and how you feel. If the weight is too heavy, reduce it, and make your muscles work to strengthen. For example, if you are doing squats and you feel it more in your lower back than your glutes and quadriceps muscles, that probably means your lower back muscles need to be strengthen. So focus on lower back exercises. Think proactive and not reactive. Trust me, an injury will occur and set you back if you continue to push beyond what your body can handle. You are training for a journey. What matters is that you continually get better day after a day. Take it one step at a time. If you perfect each repetition, each set, each training session, you will build a foundation for a healthier you. Who cares what you can lift, what matters is that you are fit for the activity you like to do. This isn’t just advice for hunters, its for everyone. Train smart, train hard, & Hunt Strong.